Two tours share the walkway outside Bapst Library. The one at left is led by Isaiah Cyprien ’19, the other by Will Pisano ’18. Click image to enlarge. • Could my daughter have a byline in a biology research journal in her freshman year? • Where and when is Mass held on weekdays? • Is your management school Bloomberg-certified? • When did this place start to feel like home? Most visitors on this day appear eager, but others seem wearied, perhaps by the previous day’s cross-country flight, or hours on the college-tour bus (next stop, MIT). Young children accompany some families, blasting plasma beams into zombies on iPhones while waiting for the next meal break. Most parents and their high schoolers will spend two hours at Boston College. During the first, they’ll attend an “Eagle Eye Information Session” led by an admission staff member and featuring student panelists; during hour two they’ll take a walking tour of about a dozen Middle Campus locations. Three weeks earlier, John L. Mahoney Jr. ’79, director of undergraduate admission since 1990, gave his annual pep talk to this summer’s 18 student panelists and tour guides. The students had been selected from more than 100 interviewed applicants for their institutional knowledge, charisma, public speaking skills, and collective demographic and academic diversity. Over 12 weeks, they would be paid $11 an hour to “act as the voice of our 9,100 undergraduates,” says Mahoney. The admission office greeting room, 15 minutes before the 1:00 info session. Click image to enlarge. On June 28, the work begins at 9:00 a.m., when teams “South End,” “Cambridge,” and “North End” report for their weekly half-hour review in Admission’s Devlin Hall conference room. These summer teams are made up of six students each. (The assignments are shuffled and the teams are renamed every three weeks to keep the work fresh. The previous week’s teams were named after Hillside Café sandwiches.) During this week’s review, the students share visitors’ questions from the past week that stumped them, and admission staff Kayte Hager ’08 and Zach Wielgus ’11 help them find answers so they won’t be stumped again. Where’s the crew team’s boathouse? (On the Charles in Newton, three miles from campus.) What did Wallace E. Carroll ’28, H’57, the School of Management’s namesake, do? (He was a bricklayer’s helper who went on to found a manufacturing conglomerate.) One mother had asked for the University’s suicide rate. Suicide, while not unknown at Boston College, is very rare. The admission staff members review with the students the University’s mental health services and referral systems for faculty and staff. By 9:20, more than 100 parents and their teenagers have crowded into the Office of Undergraduate Admission’s greeting room next door, spilling into the lobby. Some watch footage of the campus on a flat-screen between the arched windows. Others read brochures. Half a dozen gather around the receptionist, asking about TOEFL scores for international students, study abroad programs, and how to validate their parking. By 9:30, the visitors are in Gasson Hall’s auditorium. They sit beneath portraits of 24 past presidents of Boston College. Some parents have notebooks in their hands. Some will end up writing on napkins or the backs of BC Bookstore receipts. A toddler at the rear of the room stretches out across three chairs. And then associate director of admission Susan Migliorisi ’93, a one-time English major who’s been with the admission office since 1999, opens the proceedings with a 15-minute overview of the University and its mission. Hager (right), during the undergraduate guides’ weekly 9:00 a.m. review in the admission office conference room. Click image to enlarge. Migliorisi concludes her brief presentation with a Boston College parable. It’s the story of Kat (Wakeham) Barnes ’07. One evening during her freshman year, Wakeham was in the Flynn RecPlex, reading a book on HIV/AIDS while on a treadmill. The man on the treadmill beside her turned out to be theology professor James Keenan, SJ. Seeing her book, he told Barnes, “You need to take my course, ‘Ethical Issues of HIV/AIDS’.” So began a mentorship, “one of the hallmarks of Boston College,” Migliorisi notes. “Faculty connect with our students to foster academic and personal development.” Barnes became a biology major, interned with a medical missionary program in Tanzania, worked with the Jesuit Volunteer Corps, and graduated from Harvard Medical School. She’s now a family physician in Seattle. Five members of Team South End then walk single-file to director’s chairs set up in front of the room. 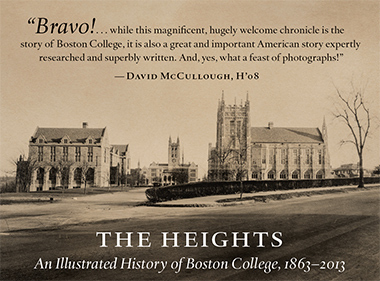 Each introduces himself or herself by recalling a formative Boston College experience. Will Pisano ’18, in his central Florida drawl, talks about researching Toxoplasma gondii, a common parasite in developed nations. (His byline is slated to appear in a science journal later this year.) Diana Dinkel ’19, a Michigander in the Lynch School of Education, recounts her 48 Hours retreat—two days of reflection for first-year students, on Cape Cod—where she “realized everyone was going through the same transition, and was just as vulnerable and homesick as I was.” (This prompts sympathetic nods from audience members, parents and offspring alike.) Bronx native and finance and business analytics major Isaiah Cyprien ’19, sporting a sky-blue Oxford, Nantucket red pants, and a flat top, talks about “finding a home outside the classroom” with a student-run consultancy for startups in Boston. When he uses the phrase “real deliverables to real businesses,” at least two mothers shoot their sons raised- eyebrow looks of, Well, doesn’t that sound practical? Of the dozen or so colleges she considered, Dinkel replied, only Boston College met all her critical preferences: Catholic, near a city but not in a city, a top-tier research institution, and with Division I athletics. Cyprien admitted that Boston College wasn’t his first choice. “So if you ask me why I came to BC, it’s because I had to.” After the laughter subsided, he said, “I’ll tell you why I stayed. The people.” He mentioned “super involved” classmates, and “incredibly supportive” faculty and advisors. Noting that she herself is Catholic, Dinkel says she’s taken advantage of religious retreat programs and the frequent Masses offered by the University’s chaplaincy and the Jesuit community. She adds that “even some of my atheist friends” treat the Jesuits who live in the residence halls as confidants. From left: Team South End’s Cyprien, Yun, Pisano, and Victoria DiMillo ’17, during the 2:15 info session in Gasson 100. Click image to enlarge. Following the 9:30 session’s Q&A, Migliorisi runs through the application process. Parents scribble furiously. 10:30: Team Cambridge arrives to lead a set of tours. The students have prepared for this work by studying a 40-page handbook of University history, data, and tips on answering common questions (e.g., Do students feel safe on campus at night?). They also observe a loose on-the-job dress code (no acid-washed jeans, no gear from another college). But they’re encouraged to design their own routes through the Middle Campus and tell their own stories. Max Bechtold ’18, a chipper, red-headed history major, greets his tour group of 20 in the Gasson rotunda. After a quick review of the University’s origins as a school for the poor sons of immigrants, the Connecticut native leads the visitors out towards the Stokes Green (gesturing back to the spires of the “most Instagrammed academic building in America”). Noting that the University supports no fraternities or sororities—information that always seems to draw a choral hmm from tour groups—Bechtold adds, “Our 280 clubs are the pulse of the campus. [But] if you can’t find one that’s right for you, you can start your own.” He notes that in 2015 he and friends founded the Common Tones, a co-ed a cappella group. Parents and prospects at the 9:30 panel in Gasson 100. Click image to enlarge. The group looks confused. His father clarifies: “He’s a pilot.” If Ben intended to impress his fellow prospects, he did. Bechtold leads his group to McElroy Commons, where he explains housing and meal plans. He notes that male students, discovering that they’ve drained their meal card investments before the semester ends, will look to have dinner with women friends, who often still have funds. “It’s kind of how dating works here at BC,” he jokes. Before the day’s out, I will hear three other guides tell pretty much the same joke. Bechtold stops his group in front of the statue of St. Ignatius to talk about the core curriculum and then leads them into the Higgins atrium for a conversation about undergraduate research opportunities. He ends his tour atop the Higgins Stairs, overlooking Conte Forum and Alumni Stadium, and tells the prospective students that if they enroll at Boston College they’re “bound to enjoy better luck” with athletics than he and his fellow Eagles experienced last year. He wishes the students success in applying to college, the group applauds, and the majority quickly disperse, some back to the Admission Office, some to the bookstore, some to the next college. Between days working as an admission guide, Dinkel adds, she’s volunteering at Brigham and Women’s maternity ward this summer. At the end of his 11:45 tour, Yun takes questions from two students visiting from Brooklyn’s Coney Island Prep. Click image to enlarge. Finance major Courtney Severance ’19 responds that “extremely accessible professors” helped her when she found her confidence challenged by the move from her Wisconsin high school, where she was a top student, to a school where “basically everyone was at the top of their high school class.” And she mentions the assigned readings in philosophy (Plato, Aristotle, Kant) in the Carroll School’s Portico class for freshmen that helped shape an “ethical foundation” for her business aspirations. 2:00: Team North End takes over for the penultimate tour, and a Groundhog Day effect kicks in. We are back under the Stokes archway learning about the difference between internal and external study abroad programs. There’s another mom draping her arm around her son’s shoulder when the guide mentions the three-pronged reflection familiar to many Boston College students: “What do you value? What are you good at? And does the world need you to do it?” Here we stand again in Fulton Hall, hearing that the architect of the atrium was inspired by The Wizard of Oz—the conical lamps a nod to the Tin Man’s hat, the ruby tiles a reference to Dorothy’s slippers. The undergraduate guides are air tight with most of their facts, and Wielgus and Hager often drop in on tours to make sure. But the Oz story is pure tour guide folklore, passed down at least since I first visited campus a decade ago. With the greeting room in Devlin full, a family passes time in the hall before the 1:00 session. Click image to enlarge. Omnipresent throughout the day is John Mahoney. I see his head appear in the doorway behind the podium during the 9:30 panel, assessing the crowd. He brings Team North End into a huddle before their 10:45 panel. He comes into view again outside an arched window of Devlin 101 at 1:45. 4:30: And there he is again, talking with parents in front of Devlin after the final tour. Nearby, a father is asking a guide if there is a way to know how much financial aid the University might provide before his daughter applies (answer: the financial aid office will offer a ballpark figure over the phone). A couple of families sit on the concrete benches of O’Neill Plaza, trading impressions. A son takes a selfie with his father that captures Gasson Hall. A few student guides chat under Devlin’s archway. Today is done. Six-hundred and fifty visitors have registered for tomorrow, 570 for Thursday, and more than 1,000 for Friday. Visitors I talked with over the course of the day said they had sought out Boston College because of Boston, because of advice (expert, friendly, and familial), and because of the University’s ranking in U.S. News & World Report, Forbes, the Princeton Review, Bloomberg Businessweek, the Economist, Kiplinger’s, et. al. They heard hundreds of data points over their two-hour stop: the average SAT, SAT II, ACT, AP, TOEFL scores of accepted students; that only 30 percent of applicants are admitted; that for the Carroll School that figure is 22 percent, for the Connell School of Nursing, 26 percent; that 60 percent of freshmen live on Upper Campus; that certain majors require 10 courses, others 12; that Newton is the third safest city in America. Rodriguez-Rowe (left) in the Fulton atrium with her 10:30 group. Click image to enlarge. But the college visit is about experience, sights, voices, feelings. A rising senior from Concord, New Hampshire, told me he was impressed by the absolute zero freezer in a physics lab he visited. Others seemed particularly struck to learn that Robert Frost had spoken in Gasson 100, the room they were sitting in; or that dining hall staff at Boston College receive the same employee benefits as tenured faculty; or that Diana Dinkel said her first class at Boston College enrolled “more students than were in my entire high school class” and the faculty member already knew all 120 faces and names on day one. In the fall of 1996, as focus group after focus group of parents reviewed Boston College’s information sessions, director of undergraduate admission John Mahoney Jr. ’79 (left) watched, horrified. “They told us we were colossally boring,” he remembers. “That we regurgitate the same statistics they already knew.” At one point, a mother turned toward him and said, “And you all think you’re so funny. But you’re not.” It was time for a change. But the University’s demographics were rapidly evolving in the 1990s. Record numbers of female, minority, and international students were applying. According to Mahoney, by 1996, the total applicant pool had grown to 16,500 (which would double by 2015), for 6,750 acceptances, and an eventual enrollment of 2,450. And, throughout higher education, the advent in the early 1980s of popular rankings “commoditized higher education and created a frenzy of anxiety and tension” for parents, applicants, and colleges alike. Today, for many students and even more parents, rankings have become “game, set, match,” says Mahoney, a stand-in for consideration of how well a university fits an individual student.